Wondering who can water your plants while you're on vacation? Or have trouble remembering to water them even when you're home? Just let the Plant Nanny take care of them for you! 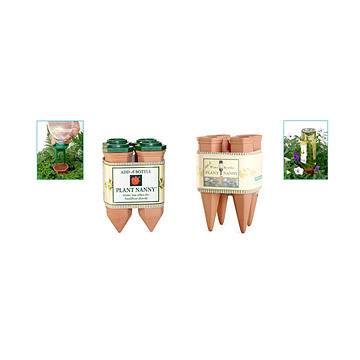 Add-a-Bottle Plant Nannies (set of 4) (left) for plastic bottles - up to 2 liters. Wine Bottle Plant Nannies (set of 4) (right) for leftovers from your romantic dinner the night before. Click here to see details and utility. 5" H x 1" dia. Not frost-proof. The rate at which the plant will use the water in the reservoir is dependent upon the type of plant, the outside temperature, the humidity, and most importantly, the composition of the soil. I love em. Wish I could buy more. a bit of trial and error involved but once you get it right this is a great product. not all bottles are threaded the same. i had to try many bottles before i found the right one. the plant nanny website suggests bottles that work but i did not find those bottle types to always work. i eventually realized that you have to give several tries screwing it together before the fit is secured properly. good luck!